Continuing our experiments with a variety of lunch sandwich options, today we put together pastrami, spicy labné and tabouli, and hummus with some of the Crunchy Mediterranean salad from last night. The salad kit is $3.50 but makes four serves and we used half a serve between us, or 22c per serve. Add 25c for spicy labné. Today’s sandwiches provided a nice variety of flavor and texture. The tabouli almost disappeared in the pastrami sandwich, but did add a little texture and wetness that was appreciated for $2.72 per serve. Time for one of our favorite burgers: Portobello mushroom with bacon, caramelized onion, brie and arugula. The bacon is optional as we had one vegetarian guest for dinner. We served it with a Tropical Mango salad kit from Trader Joe’s. The salad kit was $3.99 or 80c per serve. This burger won over our slightly skeptical (meat eating) guests and was a major hit with our vegetarian guest. This is our favorite burger, and has a lot more flavor and textural variety than a typical meat burger. All in the meal was extremely satisfying for $4.15 per serve. We’ve enjoyed smoked salmon on a bagel and on crisp bread so why not on a sprouted rye sandwich? So we did. Add 15c for capers and shallot. Smoked salmon works as a sandwich. We preferred it to the somewhat doughy consistency of a bagel. Not bad for $3.92 per serve. As we finished up in Santa Monica a little earlier than expected, we decided to brave the -still growing – traffic and drive home earlier, up through Topanga Canyon. As we’d previously planned to eat in Santa Monica to wait out the traffic, we had no specific plans for dinner, which had to change. We still had chicken legs (thigh and drumstick) so we stopped in at our local supermarkets and picked up a Mediterranean Crunch Salad with balsamic dressing. We’ve had good experiences with these Taylor Farms salad kits, and this one was no exception. We added a little of the tomato sauce from last night’s dinner, which was great with the chicken. The salad kit is $3.50 but makes four serves, or 88c per serve. An impromptu meal, admittedly with semi prepared (but minimally processed) ingredients, but still tasty and nutritious for $2.63 per serve. Foodie Philip was in Burbank so ate his normal Double Double for $4.26. Greg has been wanting to try a fresh tomato sauce for a long time, but not one that was similar to a gazpacho. This recipe was a winner! Full of fresh tomato flavor, a good texture – not too liquid – and likely to be versatile (as we have about half left). The great flavor was, no doubt, enhanced by the heirloom tomatoes we used. 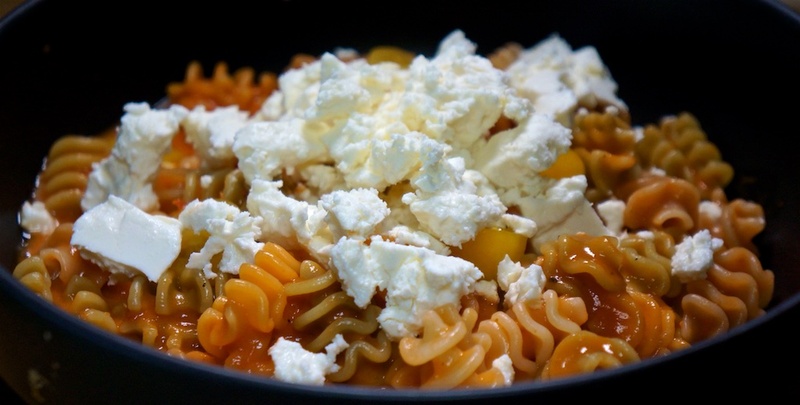 We dropped the basil (because Philip is not a fan) and substituted feta for the cheese. We’ll get four serves from the tomato sauce. The tickler radiatore pasta was $1.9 or $1.00 per serve. Dinner tonight was fresh, tasty and a great summer evening meal, for $3.40 per serve. We were nearby so we couldn’t resist picking up one of the excellent Bahn Mi from Pho Saigon 1 nearby. Lunch today cost $8.25 per serve. 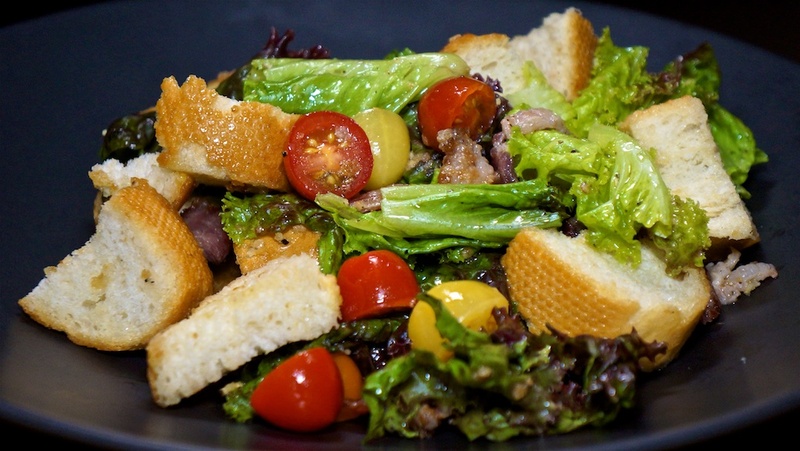 If you have a good supply of tomatoes, and love bacon and good bread, why not try a BTL Panzanella, one of Alton Brown’s recipes. For bread we used the remaining baguette. We dropped the mint. Add 15c for the oil and vinegar in the dressing. Dinner tonight was a refreshing summer salad at $2.94 per serve. A trip to Jon’s produced a baguette, freshly roasted chicken, and a heirloom tomato, which goes together very well! Lunch today was $1.99 per serve and pretty damned good. We decided to use up the other half of the disappointing Rogan Josh curry simmer sauce so Greg respiced it. We served with a tomato relish and the remaining gnaan. The meat sauce serves four. The tomato was 60c or 30c per serve. 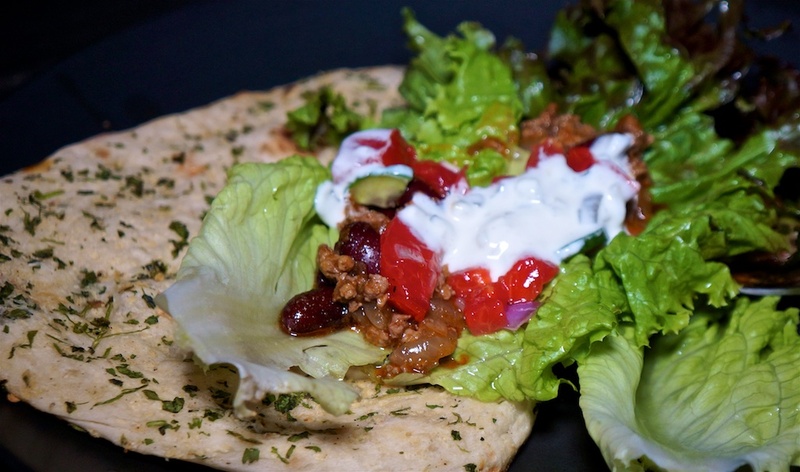 We tried serving on a lettuce leaf as a wrap, but it was way too messy, so we finished on the naan. Dinner tonight was definitely an improvement on the Rogan Josh, and cost $4.81 per serve. You can’t make just one sardine and avocado sandwich, so we each had one. Two slices of bread are 39c. Lunch today was pretty good – it’s an Alton Brown favorite – for $1.99 per serve. We generally get pork chops in our Prather Ranch meat delivery: sometimes thin sometimes thick cut with bone in. Tonight was thick cut night and grilled on our (relatively) new grill. The sweet potato was $1.81, but the mash makes four serves, or 45c per serve. A little fresh rosemary came from our herb garden. Every component of tonight’s meal was full of flavor. 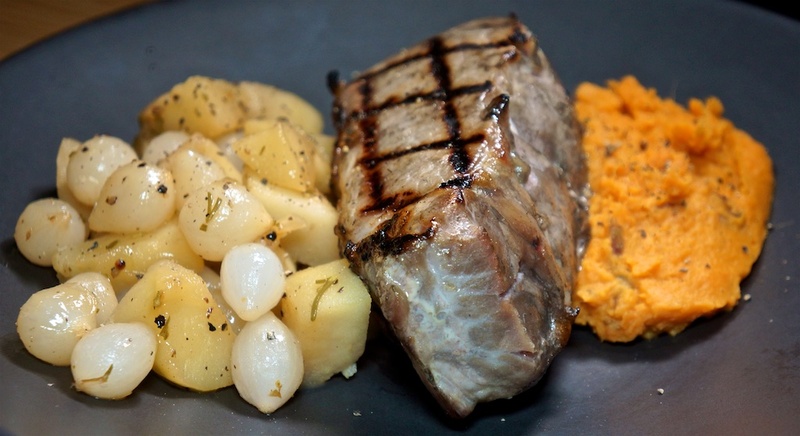 The pork chops were perfectly cooked with fat rendered soft; the sweet potato provided some carbs while the apple and pearl onion braise had an almost pickled quality about it that perfectly offset the pork. A great meal for $12.79 per serve. On our way back from a hardware store trip, we stopped in at The Country Deli. Foodie Philip had the marinated skirt steak with eggs and home fries, while Greg had the Pastrami on Rye with fries, although half the sandwich was retained for dinner. Lunch cost an average of $21.52 per serve with tax and tip. 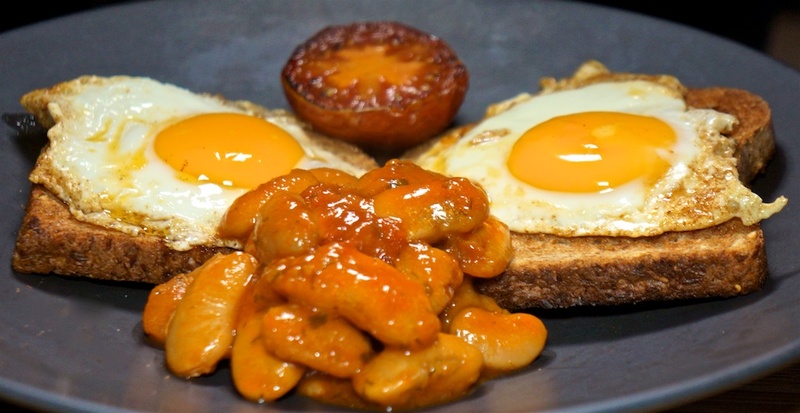 Because of the meat heavy lunch, we chose a “breakfast for dinner” evening meal: giant baked beans in tomato sauce with a fried egg and fried tomato. The kumatos (black tomato) are $3.49 for six, or 29c per serve. Today we returned to some favorite sandwiches. Add 25c for spicy labné and mustard aioli. Today’s sandwiches were returning favorites for a good reason: they’re great and just $2.34 per serve. LACPUG night and pizza followed with a $5 contribution from all of us. No heirloom tomato but a kumato and mayo is a good substitute, while the corned beef pairs surprisingly well with a spicy labné we get from Jon’s. Add 25c for mayo and spicy labné. Lunch today used up the last of our rye bread and was pretty good for $2.43 per serve. We purchased a can of Rogan Josh curry mix and decided to mix it with ground lamb. It was very disappointing, as it was pretty bland, so Greg amped it up with some heat. Served with rice and naan. The naan was $1.99 and we served half, or 50c per serve. Dinner tonight was okay, and cost $4.53 per serve. Another Burbank Monday with Foodie Philip ending up at In and Out Burger for a Double Double Animal Style, for $4.26 per serve. Time to use up the remaining chicken legs, served with a coconut rice pilaf (also chosen to use up the last half of a can of coconut milk). The chicken was steamed on top of the rice. Add 75c for the other pilaf ingredients. The coconut in the rice pilaf is a nice surprise and the chicken reheated well. Overall, a very satisfactory meal for $3.28 per serve.